New York City FC is New York’s second professional football team, after the New York Red Bulls. The team was founded in 2013 by the English Premier League club Manchester City FC and baseball team New York Yankees. They play in the Major League Soccer, America’s most famous football league. Some of their players are big names in football, like David Villa. 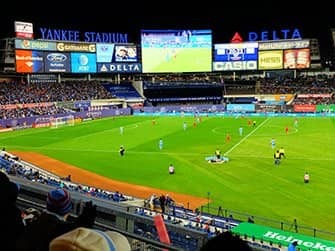 Lacking their own stadium, New York City Football Club currently uses the Yankee Stadium in The Bronx. No service fee and free shipping (mobile tickets)! Although people don’t think too much of football in the U.S., it’s definitely worth visiting a match. The Americans know the art of cheering and this new club has a loyal following. Fun fact: their club colours are sky blue like Manchester City, marine blue like the Yankees and orange, referring to New York’s Dutch roots. Ticket prices vary from 30 to 300 dollars. Seats behind the goals are often cheaper, but keep in mind you have lesser views of the field. Click here to look for the date when you wish to visit a football game or view the table below. 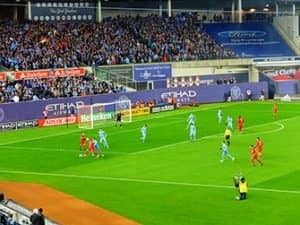 Tickets for New York City FC can be paid for by credit card. You will receive mobile tickets. The mobile tickets can’t and don’t need to be printed out. If you have questions about your tickets, drop by the office which is centrally located, near Times Square. Your tickets are 100% guaranteed authentic and will be available on time. Season ticket holders who cannot make the game provide the tickets to the site. Therefore they are available at discounted prices. If the official tickets are sold out, these tickets consequently increase in price and can be more expensive than the originals. Eric’s Tip: If you like to sit in the most enthusiastic part of the crowd, search for tickets in the supporters section (235 to 238). If you prefer a calmer area or are visiting the game with kids I would advise to buy tickets in a different section. Tickets in the 100-series for the stadium’s long side are a good option. As Yankee Stadium is built for baseball, during a football game some seats are further away from the field than others. The view of the field however is good from every seat on the long side. New York’s football season runs every year from early March to late October. 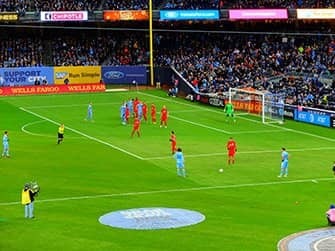 New York City FC plays its games at the Yankee Stadium in the Bronx. You can easily reach the stadium coming from Manhattan. I recommend to arrive at least 30 – 60 minutes before the game. This way you’ll have plenty of time to find your seat and to watch the pre-game activities. If you arrive early you will also have some time to explore the stadium. For a great view of the field check out the Yankee Memorial below the video board, called Monument Park. You can visit Monument Park for free, it remains accessible until 45 minutes prior to the scheduled start time of the game. How to get to the Yankee Stadium? The Yankee Stadium is best reached by subway. The stadium is located opposite metro station ‘161 Street’. Line 4 takes you directly to the Yankee stadium. You can also take lines B or D, but they don’t always stop at this point at certain times. Still choosing one of these lines? Ask a New Yorker if it will be stopping at ‘161 Street’. All lines run all the way through Manhattan and you can hop on at any point. See below for a list of dates and book directly!